Five years after the Tohoku tsunami, scientists seek to improve rescue operations by simulating the record setting earthquake on the Japanese K supercomputer. Japan looks to improve its responsiveness after the devastating 2011 Tohoku tsunami. 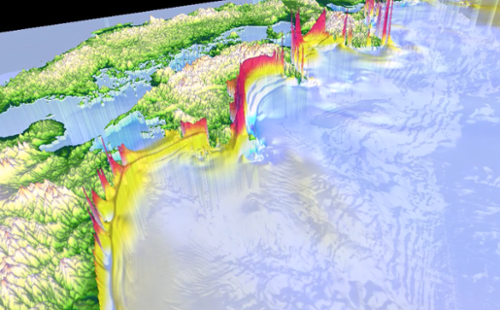 K supercomputer simulations model inundation, earthquake scenarios, and wave heights. Insights gained from these models will enhance disaster relief. Five years ago this month, a magnitude 9.0 earthquake occurred about 40 miles (70 km) off the northeast coast of Japan. The resulting tsunami caused in severe structural damage and the loss of many lives — almost 16,000 dead, over 6,000 injured, and 2,500 missing. Tohoku earthquake and tsunami. Nearly 16,000 people died when the Tohoku tsunami struck in March of 2011. Improving rescue operations in the future was the aim of researchers when they used the K supercomputer to create this tsunami inundation simulation. The Japanese government estimates an earthquake striking closer to the coast could result in over 300,000 fatalities. Courtesy Toshitaka Baba. The Japan Meteorological Agency issued a tsunami early warning immediately after the undersea megathrust earthquake, but despite their best attempts were only able to predict the tsunami height at the coast. A reassessment of the risk of tsunamis coming from the Nankai trough that spawned the 2011 event concluded a worst-case scenario earthquake (one closer to the coast) and its subsequent tsunami might cause up to 323,000 fatalities. Japan has implemented some broad improvements to its ability to predict and react to incoming tsunamis, but more is still needed. 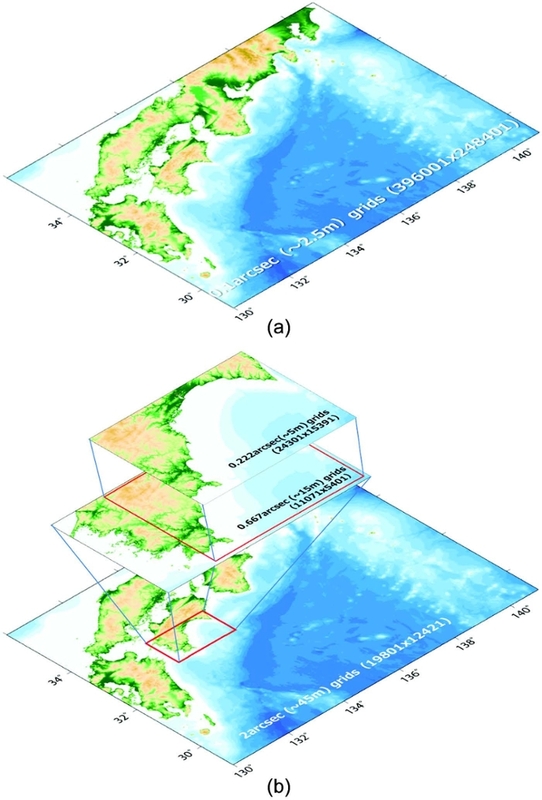 To improve rescue operations in the event of the next tsunami, scientists simulated the record-setting earthquake on the K supercomputer at the RIKEN Advanced Institute for Computational Science. The K computer (‘kei’ — Japanese for 10 quadrillion) is the fastest computer in Japan and was fastest in the world from June 2011 to June 2012. For the tsunami simulations, the researcher crafted two models. The Nankai model occupied the full K system (82,944 nodes 663,552 cores) to calculate 100 billion grid points. The Kochi model, nested within the first model, took 8,748 nodes (69,984 cores) of the K computer, calculating 0.68 billion grid points in total. Since a tsunami can cause widespread coastal damage (800 km/497 mi in the 2011 event), one of the numerical challenges to crafting a simulation is having to cover a wide area. Researchers also wanted their model to handle up to 10 meters of water coverage (~32 feet) in order to simulate the flow of water inundating a land mass — what the earlier simulations could not do, in other words. Reliable models also need to consider many different earthquake scenarios.